November is here and that means Thanksgiving is around the corner. Looking for the perfect wine to enjoy with your Thanksgiving meal? Try a Beaujolais. Not a Beaujolais Nouveau but one from one of the Crus of Beaujolais, which I wrote about in my recent column in the Napa Valley Register and you can read here. Have you been waiting for November to drink Beaujolais? I hope not! Beaujolais is so much more than the Beaujolais Nouveau released each November, just after harvest and just in time for Thanksgiving dinner. But if you have been waiting for November to drink Beaujolais, it is time to get serious about Beaujolais. There are different styles of Beaujolais that will satisfy all palates, styles and desires. And Beaujolais prices are affordable. So, when you cannot afford to spend hundreds of dollars on a bottle of Burgundy, a bottle of Beaujolais will satisfy. Beaujolais is located immediately south of Burgundy. While it is sometimes considered a part of Burgundy, it is not. Unlike Burgundy, which grows Pinot Noir, the grape of Beaujolais is Gamay. Gamay is not the shallow one-dimensional grape you might think it is but rather a grape that will charm and has the power to seduce. The northern half of the Beaujolais region, which is just south of Macon region of Burgundy, is where the famous ten Crus (vineyard areas) of Beaujolais are located. The northern part of Beaujolais consists of 67 square miles and there are 12,000 hectares of Crus vines. The Crus make up half of this land and 50 percent of the total production of Beaujolais. The terroir in the north includes rolling granite hills with sections of clay and limestone which produce aromatic and complex wines with structure. In comparison, the lighter and fruiter-style wines come from the southern part of Beaujolais where it is flatter and has more sandstone-based soils. The 10 Crus of Beaujolais are Brouilly, Chénas, Chiroubles, Côte de Brouilly, Fleurie, Juliénas, Morgon, Moulin-à-Vent, Régnié and Saint-Amour. There are subtleties between each Cru that make the wines distinct. The key is to understand each sub-appellation of Beaujolais in order to understand the nuanced diversity Beaujolais has to offer. Fleurie – With 857 hectares and 180 growers, Fleurie is one of the most well-known appellations. It established AOC status in 1936 and is known for elegant, delicate, perfumed wines as a result of the sandy pink granite soils. Chiroubles—The highest and coolest of the Crus, Chiroubles consists of 350 hectares and 60 growers and was granted AOC status in 1936. The soils consist of decomposed sandy pink granite which contribute to the fragrant wines with high tones and easy-to-drink style. Régnié – Granted AOC status in 1988, Régnié is the newest cru in Beaujolais. There are 400 hectares and 80 growers in this region, which also consists of decomposed pink soil which result in a fresh wine with tangy fruit notes. Saint-Amour – The most northerly cru, Saint-Amour is directly south of Pouilly-Fuissé. Made up of 313 hectares and 115 growers, Saint-Amour was granted AOC status in 1946. The soils are granite, schist, alluvium and limestone resulting in wines with medium weight and what some call a “peachy” aroma. Juliénas – An ancient wine grapegrowing zone originally planted by the Romans, Juliénas covers 620 hectares and 120 growers and was granted AOC status in 1948. The soils in the west are metamorphic soils resulting in floral wines with bright acidity, whereas in the east, there is more sand and clay resulting in wines with more fruit and spice. Morgon – Located in the center of Beaujolais, Morgon, granted AOC status in 1936, is the second largest Cru with 1126 hectares and 250 growers. Pink granite is found in the northwest, alluvial soils in the east and schist in the south, resulting in a diversity of styles of wine. Brouilly – The largest Cru with 1327 hectares and 530 growers, Brouilly accounts for 20 percent of the total area of the ten crus. It is a doughnut-shaped appellation that spreads over six communes and was granted AOC status in 1938. 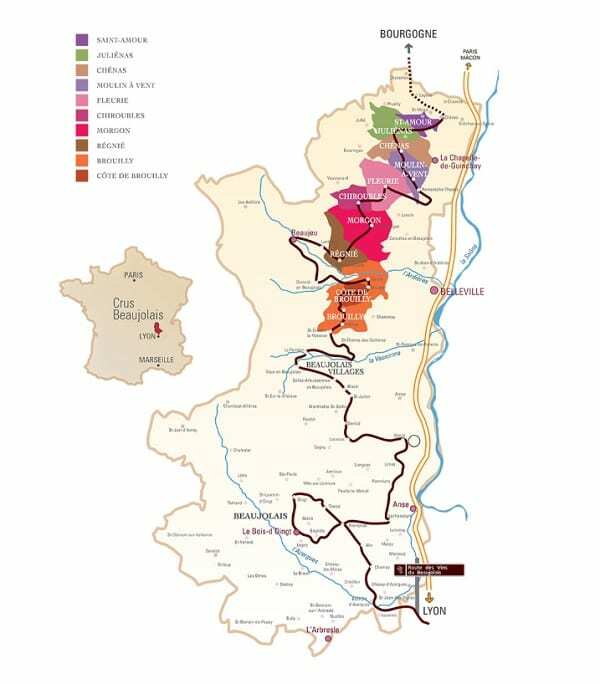 The soils of Brouilly are very diverse with sandy pink granite to the west, volcanic soils to the north and limestone and alluvial clay soils to the east. Chénas – The smallest of the Crus, Chénas consists of 253 hectares and 100 growers and was granted AOC status in 1936. With northeast facing slopes that are very steep, the soils are poor, coarse-grained and diverse. The wines of Chénas are generally fruity and approachable and marked with velvety tannins and high acidity. Moulin-à-Vent – Southeast of Chénas, Moulin-à-Vent is located on 200-meter slopes. Granted AOC status in 1936, Moulin-à-Vent consists of 663 hectares and 280 growers. The pink granite soils with quartz veining and bands of manganese result in masculine wines with dark, spicy, earthy characteristics. Côte de Brouilly—Granted AOC status in 1938, Côte de Brouilly is one of the smallest Crus with 300 hectares and 50 growers. The vineyards are shaped in a ring and the vines are planted on the hill, allowing the sun to reach the grapes. Côte de Brouilly is famous for a monolithic outcropping of diorite quartz that is rich in sodium called “Pierre de Brouilly”. In general, Côte de Brouilly produces firm, minerally-intense wines with good freshness. Enjoy a bottle of Beaujolais with your upcoming Thanksgiving dinner. But with all of the styles available, enjoy bottles of Beaujolais year round. This entry was posted in Wine and tagged Beaujolais, Beaujolais Cru, Brouilly, Chénas, Chiroubles, Côte de Brouilly, Fleurie, France, French wine, Gamay, Juliénas, Morgon, Moulin-à-Vent, Napa Valley Register, Régnié, Saint-Amour, Wine by Allison Levine.